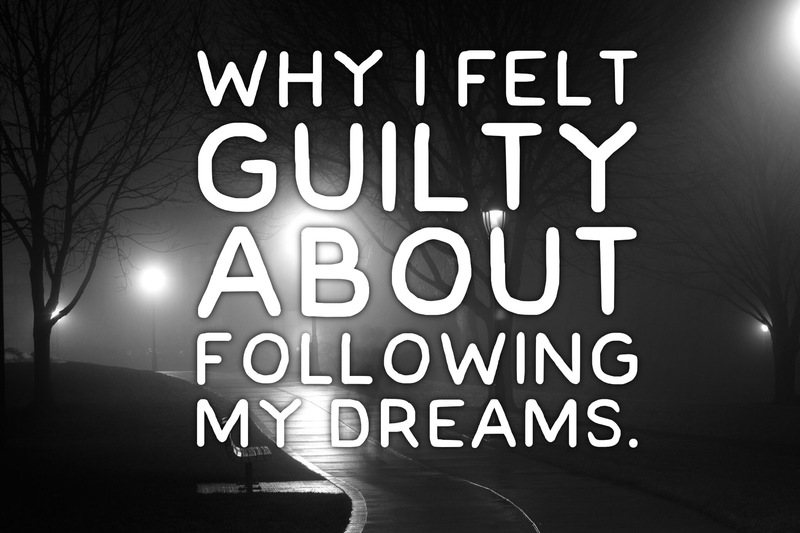 Why I Felt Guilty About Following My Dream. As a writer you reach a point in your life where you either have to figure a way to keep writing or give up on it. This often happens when you’re close to reaching your goal of publication, but you’re unaware of that. Throughout my life I’ve told stories of one manner or another. I told them to people so they’d think I was interesting, to myself so I’d like me and to my parents so they’d think I was a good kid. I learned through those stories that I love to create characters from nothing and that with them I could do anything, but something stopped me on the way. I felt insecure about my writing, which happens often to writers. Something Amanda Palmer has called the fraud police. At some point I thought people would accuse me of not supporting my family in the “traditional way” and this led me to wonder whether I should keep writing. In my early twenties, a friend who knew that I loved to write said I should write a book. So I did, a horrible, awfully constructed vampire book. What I learned from that book is that finishing a book was possible and that I really enjoyed it, then the fraud police showed up in the form of someone else and I stopped writing as much. It was after I started writing again and finished another book I felt the fraud police again, in the same form as the last time. I stopped writing for a while, again and fell into a deep depression which I’ve talked about here, which led me to transcendental meditation and getting through my depression. After I began TM I started writing again. Little bits at a time until I was ready to tackle something bigger. The something bigger is the second novel I finished and I’m now in my third rewrite and fourth draft of it. When my wife and I moved, with the promise of being able to write full-time and bartend part-time, I felt guilty about writing. Not because I was afraid of the fraud police, but because I wanted to follow my dream. Following my dream of being a writer is something that’s haunted me for most of my adult life and I only now understand why. I’m doing something most people can’t or won’t do. Follow their dream. When we decide to follow our dreams and our life allows that possibility to creep in, we think we’re getting away with something, at least I do. I see all my friends and I know they have dreams they want to follow, and some of them are, but there are others who I really want to help, but they’re so used to being in the life they have they’ve forgotten about the dreams they once had, and the fact that I’m able to follow my dream, makes me feel guilty. Now that I’m getting past the guilt of following my dream and embracing it I understand who I once was as a writer and I love him because he allowed me to be who I am and create the worlds I love. Next Post When You Realize What It Takes To Do What You Want.